World War I fighter ace, for whom George Air Force Base, Victorville, California, is named. He was born in 1892 in Lockport, New York, and was killed in action April 29, 1942 near Darwin, Australia. Harold George graduated from high school at Niagara Falls, New York, and enlisted in the New York National Guard's 3d Infantry in 1916. In mid-1917 he completed flying training on the Curtiss biplane at Mineola, New York, and was commissioned a First Lieutenant in the Signal Corps' Aviation Section. He went to Kelly Field, Texas, for additional training before going to Tours, France, as commanding officer of the 201st Aero Squadron in October 1917. For six months he instructed other pilots at the training center at Issoudun. 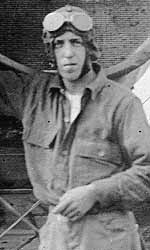 He then took pursuit pilot and gunnery courses himself and went into combat in August 1918 with the 185th Aero Squadron, and later duty with the 139th. In the two months remaining of World War I, George scored five victories over German planes in the air to qualify as an ace. On October 27, 1918, near Bantheville, France, he struck a formation of four enemy Fokkers, destroying two and driving the other two away. He received the Distinguished Service Cross for this heroism in action. After the war he returned to the United States for duty at Langley Field, Virginia. In November 1919 he became flight commander and commanding officer of the 19th Pursuit Squadron at March Field, California, serving until March 1922. He went to Fort Douglas, Utah, for three years as air officer of the 104th Division. He was transferred to Kelly Field, Texas, in March 1925 and taught flying for two years, becoming commanding officer of the 43d School Squadron there in October 1929. He next went to Panama for two years, as operations officer and commanding officer of the 24th and 7th squadrons, respectively. He returned to Langley Field in January 1932 for four years as commanding officer of the 8th Pursuit Group and intelligence and operations officer of the 33d Squadron. In 1937 and 1938 he graduated from the Air Corps Tactical School at Maxwell Field, Alabama, and the Command and General Staff School at Fort Leavenworth, Kansas. His next assignment was to Selfridge Field, Michigan; then he commanded an aircraft-ferrying flight to Panama via Mexico and Central America, exactly 20 years after he had flown a DeHaviland plane to the Pacific Coast and return to New York in an early-day transcontinental reliability test flight. In May 1941, with promotion to brigadier general, he went to the Philippines to command all air units as a member of General MacArthur's staff. He directed the air operations in defense of the fortified islands at the entrance of Manila Bay, for which he received the Distinguished Service Medal from MacArthur. General George went to Australia with MacArthur and lost his life in an airplane accident near Darwin on April 29, 1942. The base at Victorville, California, was named for him in June 1950. The Distinguished Service Cross is presented to Harold Huston George, First Lieutenant (Air Service), U.S. Army, for extraordinary heroism in action near Bantheville, France, October 27, 1918. Lieutenant George displayed great courage in attacking a formation of four enemy planes (Fokker type), destroying two of them in a terrific fight and driving the other two back to their own territory. GENERAL MACARTHUR'S HEADQUARTERS, Australia, Thursday, April 30, 1942 - General Douglas MacArthur announced today that Brigadier General Harold H. George, United States Army Air Corps, and Melville Jacoby, correspondent for Time and Life Magazines hadbeen killed in an air accident. General George lives in Los Angeles. He went through the Philippines Campaign as General MacArthur's Air Officer and came with him to Australia. General George was born in New York in 1892. He served as a Sergeant in Company E, Third Infantry, New York National Guard, before the last war and during the first few months of it, he became a First Lieutenant in the Air Force, then called the Aviation Section of the Signal Corps. Mr. Jacoby was a veteran war correspondent in the Far East.